Inspiration is what keeps human beings engaged on a continuous journey of innovation. If I were asked to sum up the whole Social Media Day Colombo event to just one word, I would happily use the word ‘inspiration’ to describe it. By organizing the Social Media Day in Colombo, it was our main objective to appreciate the people who used Social Media in different forms than what everybody else would do. Sri Lanka is by far, a ‘content consumer nation’ on Social Media, rather than a ‘content creator’ nation. Just take a look at your Facebook friend’s network. What percentage of them is at least post a single update every month? I would say, the number will easily fall around 90%. But when you meet some of those friends after ages, at a college gathering or at a friend’s wedding, they will tell you exactly the last 10 status updates you posted and the number of likes and comments you received. For most Sri Lankans, Social Media remains the greatest man-made tool ever invented, for the purpose of stalking others and gossip finding. But not all people are like that. We have people who do great stuff with Social Media, and add great value to the society that they are a part of. At the Social Media Day Colombo, it was our objective to create a platform to showcase such people and give rest of the Sri Lankans an ‘opportunity to be inspired’. For my understanding, the event was a success. The feedback from our exact target audience was simply awesome and I believe I heard the phrase “let’s get together and do something” a quite a lot of times after the event. This is what I meant by ‘inspiration’. That unfulfilling urge to ‘do something’ after being exposed to what wonderful things that other people around you have done. It’s not copying…it’s not benchmarking.. It’s called ‘inspiration’ and that’s what we wanted to come out from Social Media Day Colombo. The fact that #SMDayCMB trended regionally as a ‘tailored trend’ on Twitter is a proof that, Social Media Day in Colombo was actually a highly engaged community activity (Some people mistaken this to be a ‘worldwide trend’ but actually it wasn’t). Inputs from @Isura, JehanR, Jason, Hemanth and Sarath immensely helped people to think out of the box, and see what we can do with Social Media beyond just the usuall stuff we do everyday. We believe, soon there will be a generation of ‘inspired Sri Lankans’ who will do more awesome stuff using Social Media. Be it using Social Media for fundraising for charities, or Social Media for entertainment… we would like to see more and more people starting to act. Were there criticisms for Social Media Day? Well, everything on this earth is subject to criticism and Social Media Day Colombo was not an exception. At start, few people were questioning the Mashable’s authority to declare 30th June as “Social Meida Day”. Then there were sincere wishes (Twishes?) from a fellow Tweep for “Social Media Day becoming a total failure”. 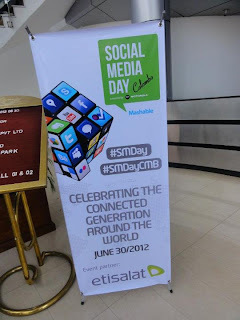 From such criticisms to the latest ‘factfinding missions’ to prove “SMDayCMB wasn’t actually trended worldwide”, there were several cynical responses from so many people. Before the event, I used just one line to answer these critics. That was “Don’t blame the darkness, got and light your own candle”. Today, I’m going to answer the critics with a slightly modified version of an old saying. “Walk along the streets of any city around the world and tell me if you find a statue of a critic”. This post is not complete, if I don’t make a remark on Etisalat, our proud event partner. Support extended by Arvind, Koshal, Rajith and rest of the team at Etisalat was simply brilliant. In fact that live Google hangout session with JehanR went so smoothly, thanks to Etisalat’s super fast internet connection.